It is funny how one can find memories in the strangest locations. After my mother got re-married my step father started to redo the basement. Instead of an open space he created a bedroom for my sister and I as well as a bathroom. This was around 2004-2005. We (my sister and I) were involved with certain decisions, such as paint colors. While the bathroom was under construction there was the selection of what tile. 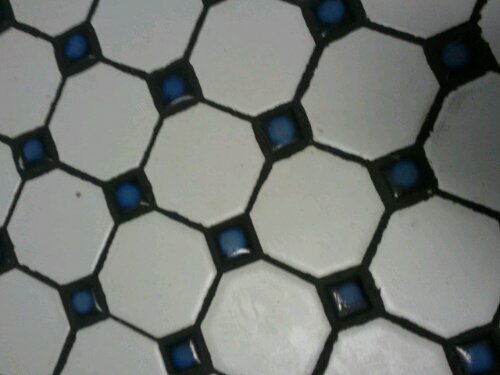 We chose a white tile with small blue diamond shapes to match the blue on the wall. My step dad even put a heating system underneath the cold tile floor. The photo above I recently took while at Star Bar in Des Moines. The floor of the women’s bathroom. It is the exact same flooring in our bathroom at home besides the black grout (ours was white). Strange that the grout gave the floor a completely different feeling. Besides that it isn’t as pretty/clean as the floor at home. The white grout and it’s ability to match the white squares made it blend, creating smoother/cleaner lines. The black grout makes it look dirty. Yet there was still a feeling of excitement, but I wouldn’t walk around on that floor barefoot.